First Lady of Malaysia receives the sculpture created by Eylanbekov. 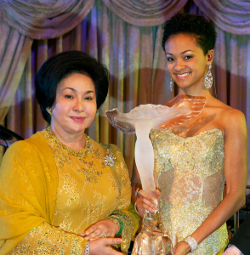 Past Sport Artist of the Year and internationally acclaimed sculptor Sergey Eylanbekov created the sculpture used for the inaugural International Peace and Harmony Award, which was presented to the First Lady of Malaysia at a ceremony in New York on Friday, 16 April 2010. From the Business Council for International Understanding (BCIU), the award was presented to Her Excellency Datin Paduka Seri Rosmah Mansor, the wife of the Honorable Dato Sri Mohd Najib Bin Tun Abdul Razak, Prime Minister of Malaysia, for her extensive charitable efforts and to celebrate the important links between Malaysia and the United States. United States Sports Academy President, Dr. Thomas P. Rosandich, whose relationship with Malaysia dates back more than 50 years, and the Academy are vital links in the chain of international cooperation. Eylanbekov was named an Official Artist for the Salt Lake City Olympic Winter Games. He produced the U.S. Olympic Team Commemorative Statue. In 2004, he won the International Olympic Committee’s Sport Art Competition for the Athens Olympics and also was named the United States Sports Academy’s Sport Artist of the Year. Datin Seri Rosmah holds many prestigious positions in various organizations in Malaysia. She is the Acting President of BAKTI, the Welfare Association of Ministry Wives, and President of the Netball Association of Wilayah Persekutuan, as well as a patron of other organizations, including the Children in Hope Foundation, Puspanita Ministry of Defense, Heart to Heart Association of Malaysia, the Persatuan Warga Cinta Negara Malaysia, and the Thalesemia Association of Malaysia.